Toad's Turnpike is the third longest course and the first course in the Flower Cup of Mario Kart 64. It is named after Toad and pictures of him are seen on the boundaries of the racetrack. The race track takes place on a public road at night. There are vehicles driving on this course which cause the racer's kart to launch into the air if a collision between the two occurs. The overall shape of this course is roughly a figure 8, with some parts of the road with varying lane quantity. All Item Boxes of this track are located in the edge of a concave area where the road includes. Toad's Turnpike also appeared as a retro track in Mario Kart 8 and Mario Kart 8 Deluxe as the final track of the Shell Cup. This course was the first in a series of similar race tracks in the Mario Kart series, to be filled with cars that come at the player. This type of race track reappears in the form of Mushroom City and Mushroom Bridge in Mario Kart: Double Dash! !, Shroom Ridge and the returning Mushroom Bridge in Mario Kart DS, Moonview Highway in Mario Kart Wii, Wuhu Loop in Mario Kart 7 and Toad Harbor in Mario Kart 8 and Mario Kart 8 Deluxe though it has to be noted that Toad Harbor features cable cars following rails instead of cars. Toad's Turnpike remains straightforward in terms of track layout. It appears as a figure-8 esque course featuring cars and trucks driving throughout the course. Various points of the track have small openings with four item boxes in each. A thin line of grass borders both sides of the track and is blocked off by a white fence. Should the player be knocked over the fence by items such as a Red Shell, Lakitu will bring the player back to the main road. In 50cc, 100cc, and 150cc, the vehicles go forward in the direction where karts go. The engine class also affects how fast the vehicles move; traffic moves slowly in 50cc, but is quite fast in 150cc. The difficulty resides in the fact that the larger vehicles go slowly through the road, sometimes blocking the player (especially at the final section, where the road becomes two-laned until the finish line, and often two vehicles travel side-by-side, making it difficult to steer between them). In EXTRA mode, the vehicles drive toward the racers at a rather fast speed (same speed as from 100cc), which causes obvious difficulties. Toad's Turnpike returns in Mario Kart 8 and Mario Kart 8 Deluxe as the final race of the Shell Cup. The course now takes place in Toad City, as seen on some cars and signs in the course. Many of the billboards of Toad himself have been removed and replaced with traffic signs and advertising billboards, a notable one being for a radio station named 64MHz, which is a reference to the course's origins. A service plaza has been added at the start-finish line, giving the English name more significance, and, similar to Mushroom City from Mario Kart: Double Dash! !, the starting banner now resembles an electronic message sign (or "matrix sign"). Although the basic figure-8 shape is unchanged, there are some changes. The track in general is much shorter and the roads are wider compared to the original. Some of the walls are now anti-gravity sections with Boost Panels, which help avoid the traffic, but the route is slower. Furthermore, the start-finish line is now on the bridge over the middle of the loop, while the merging starting area has been removed. The map also chooses at random from several traffic pattern sets and uses them for the race, allowing for a differing degree of difficulty each time; in some patterns, all vehicles are traveling the same direction as the racers. In other patterns, the far right lane (left in Mirror Mode) is traveling towards the racers, mirroring the EXTRA Mode from Mario Kart 64. Vehicles also indicate that they are changing lanes via orange turn-signal lights when the highway merges from three lanes into two. Like in the original, the vehicles tumble over any racers that drive into them, but a Super Star launches them into the air and render them harmless. Item boxes, as well as coins, now move along the road. The yellow school buses are now replaced by different colored transportation buses while the light blue tank trucks are gone. 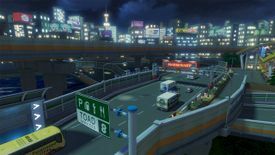 A few traffic helicopters are added, and the cars take a more realistic appearance, with some cars in different color schemes based on Toyota Comfort taxis, popular in Japan. The empty auto carrier trucks have glider ramps, and the pink pickup trucks have a surfboard which serves as a simple ramp. Should one land on a normal truck or bus, some have a small ramp. Also, vehicles cause players to flip only if they drive quickly enough into the vehicle. Toad's Turnpike is also used as one of the battle courses in Mario Kart 8. The coin sections now have a single item box. Item boxes are also stationary. The pink pickup trucks and glider trucks are also absent. The staff ghost for this track is Toad on the Standard Bike, with a time of 2:08.059. In Mario Kart 8 Deluxe, the staff ghost is Toadette with a time of 1:21.156. Mario Kart 64 Instruction Booklet: Normally, Karts shouldn't drive on a public road, but for some reason, Toad's Turnpike is one of the courses! Drive in a way so that you won't block the large buses or trucks. Cutting one off or driving too slow can cause accidents. While "turnpike" refers to a toll road, the name was not meant to be a description of the course: "turnpike" was chosen for alliteration in English and Dutch versions. Thus, for Mario Kart 8, a turnpike service area was added at the start-finish line. In Mario Kart 64, the vehicles have similar engine sounds to the karts in the game. Normal cars have the same sound as Toad's kart, trucks have the same sound as Donkey Kong's kart, and tanker trailers have the same sound as Wario and Bowser's karts. During the ending credits in Mario Kart 64, the fences around the road and the vehicles are noticeably missing. A portion of Mario Kart 7's Neo Bowser City (Koopa City in the PAL versions) course's theme has the main tune of Toad's Turnpike. In Mario Kart 8 and Mario Kart 8 Deluxe, this is one of the two retro courses where the anti-gravity sections are optional, the other being GCN Sherbet Land. This page was last edited on April 21, 2019, at 17:07.